For some reason, this has been a season defined by injuries. As a case study, we look to Sunday’s game between the Rams and the Ravens. You had Justin Forsett breaking his forearm (I’m not posting that clip, it’s nasty). Later, you had Joe Flacco tearing his ACL in the 4th and FINISHING THE GAME!!! According to Twitter, the Raven’s have 43% of their salary cap on IR now. Also in the 4th quarter, Rams QB Case Keenum got rocked on a free play sack and clearly appeared to be concussed. Still, he FINISHED THE GAME!!! Someone’s gonna get a talking to about that one. Tampa Bay crushed the Eagles this weekend and we got a double fumble play! The Chiefs went for it on 4th and goal from the one and handed the ball off to… 346lb Defensive Tackle Dontari Poe! Poe becomes the heaviest player in NFL history to score a rushing TD!! Oh, and the Packers beat the Vikings as Eddy Lacie ran for 100 yards. Sigh…. I guess the Pack is back. 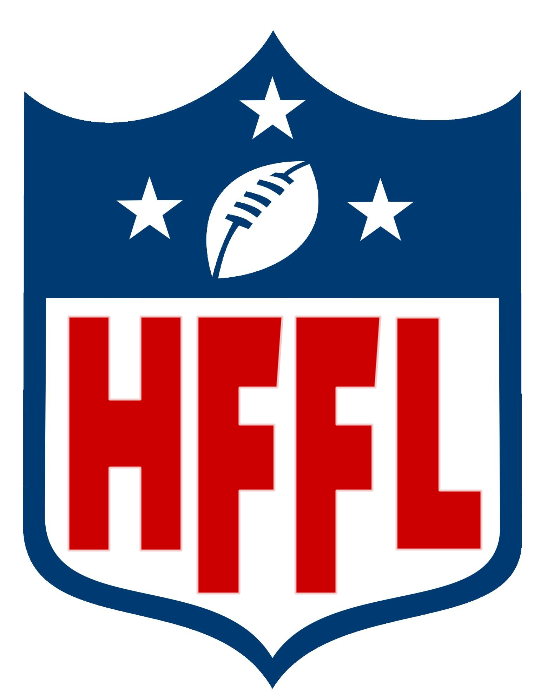 And the HFFL is careening towards a wild conclusion to the regular season! Let’s explore. 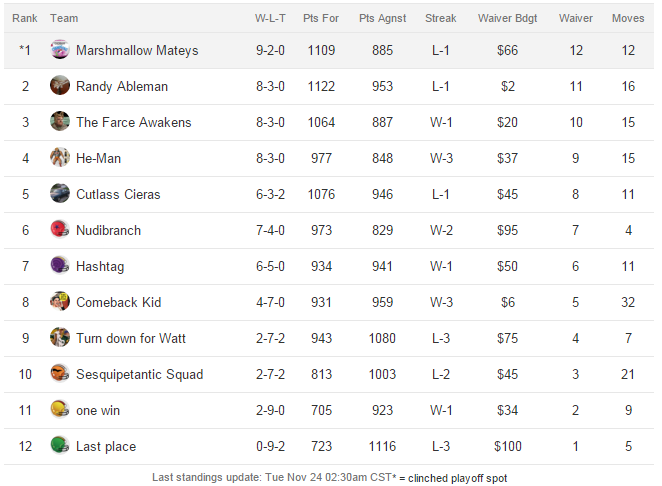 Butterslide rose up and beat WOLYA Nothing this week and stole his spot in the standings too. Joel is now positioned for a playoff spot and Tom probably needs to win out to make the playoffs (including a season finale game against the Hit Man). 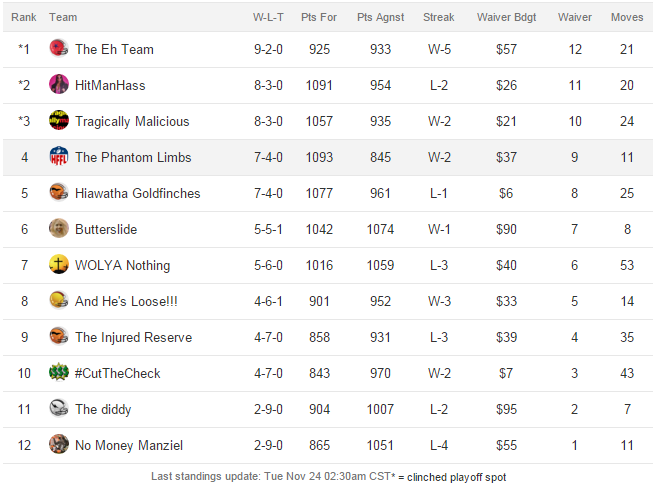 Malicious clinched his spot this week, beating The Injured Reserve. The Limbs are 7-4 after beating No Money Manziel easily. And The diddy’s season of woe continued as he lost by 9 to And He’s Loose! So the playoff picture is slowly coming into focus! Looks out for He-Man! Chris Thompson’s team has been on the rise for the last month and now has a 3 game winning streak after taking down the vaunted Mateys this week! The Mateys are still in first place and hold a playoff spot, so maybe they were resting starters already, but their #1 seed is by no means locked in yet. But it certainly helped that Hashtag came in this week and beat Randy Ableman! So the top two teams lost this week and it seems like the rest of the league is ganging up to take them down together. The Farce had no trouble beating Sesquipetantic by 51 this week and sits in the 3rd position. 3 teams are 8-3, jockeying for position as we come down the home stretch. The Cieras took a very costly loss this week to Nudibranch and dropped down to 5th while Jon moved up into 6th. In the lower half of the standings, Comeback Kid had a gut-check win this week, beating Turn down for Watt by a single point for his 3rd straight win! And someone needs a new team name! Darren’s “one win” squad picked up win #2 by beating his archrival “Last place”. A HUGE win for Darren! And Johnathan has had a rough rookie season. What makes it especially rough is that his 723 points for aren’t the problem, it’s the league-high 1116 points against! That’s an average of 101.4 points against per week so far! And that’s just bad luck. Yes, the top two teams in the standings tangled this week in what could be a PL Super Bowl preview. But, alas, Flanders was foiled! The Muffins deployed the dreaded Thomas Rawls, who (again) neutralized Cam Newton (see the LOC above). What could have been a big setback was deftly dodged by the runaway train that is The Stale Muffins. The Muffins have only lost 2 games so far this year and the target on their back is only growing larger. 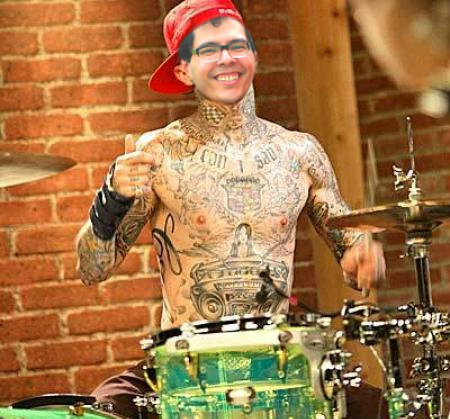 But something tells me, Mike enjoys this. Or at least he tries to. Next week, the Muffins face the Tusken Raiders, who just lost very, very badly to the resurgent KRUG by 69. Denny’s squad may not have a playoff seed in their sights, but that doesn’t mean they can’t win out in the Toilet Bowl bracket and still make the LOC next year! Creating more chaos at the top of the standings, Nana Nancy dropped their game this week to Wonky, making the knot of 7-4 teams a triple. And hanging around just below them, it’s Amanda Hugginkiss, who beat Russ in a defensive battle this week. Brian’s tie is working in his favor… for the moment, because it’s keeping just ahead of the THREE 6-5 teams! 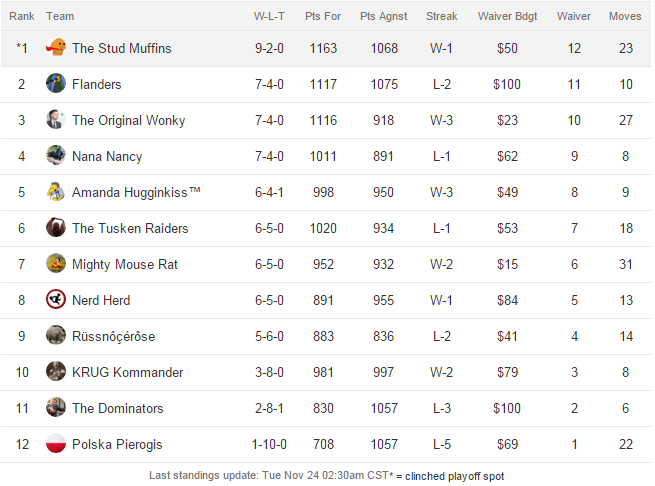 Mighty Mouse Rat is in that group after beating the Dominators handily, and so is the Nerd Herd who pushed over Polska. So the story in the PL these next two weeks will be about who takes the 2 seed and a first round bye and who is left out in the cold at #7! He’s going to have to change his team name again! Darren recently rechristened his team One Win, but he got win #2 this week! He’s now officially out of the cellar and he put his opponent into it instead. It’s not the Super Bowl, but these two teams have been rivals all season. Okay, a bunch of things to talk about here! First of all, it’s Thanksgiving Week! That means, there are NO teams on byes! Hooray! It also means, there are THREE games on Thursday!! Don’t let you travel plans derail your rosters at this critical point in the season! Check your lineups carefully before you leave town! On Thursday we get: Eagles @ Lions, Panthers @ Cowboys and Bears @ Packers!! Also, I keep talking about playoffs because they are right around the corner. Do you need a refresher on how the playoff system is set up? Click here and scroll to the bottom to read the official rules. Bottom line, the top six teams in each league are in the playoffs and the top 2 seeds get a first round bye. There is a consolation bracket for the bottom six teams that has affectionately been dubbed “The Toilet Bowl”. The top two seeds in the bottom six also get first round byes in their bracket. And remember, just because you ended up in the Toilet Bowl bracket doesn’t mean your LOC dreams have been crushed! The winner of each league’s Toilet Bowl wins a ticket to the LOC next year! 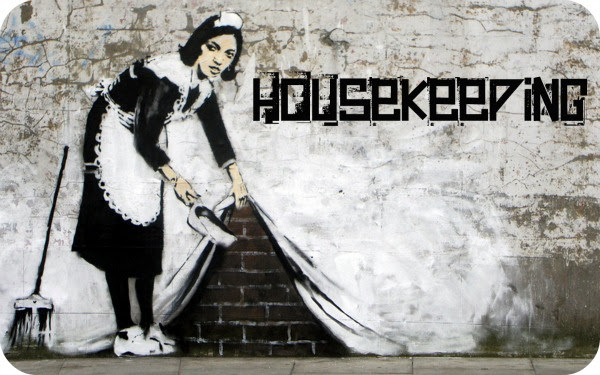 No one is a hopeless cause, even this late in the season! Don’t give up! Have a safe and happy Thanksgiving, gentlemen!